If you go Nuts for Almonds, these Almond Biscotti Recipes are for you. 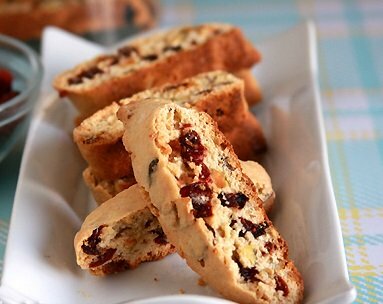 Biscotti are quickly becoming an international favorite and may one day become as beloved as the chocolate chip cookie. These crunchy, twice-baked Italian cookies can be enjoyed any hour of the day. They pair well with a steaming cup of cappuccino, dish of gelato, or even a traditional glass of sweet wine. Biscotti, now available in a vast assortment of flavors, has its humble origins in almonds. 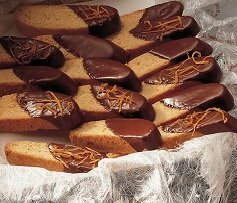 After rediscovering the original recipe in the 19th century, Prato-based pastry chef Antonio Mattei developed a variation that is now accepted as the traditional biscotti recipe. This cookie is composed exclusively of flour, sugar, eggs, pine nuts, and almonds, of which are not roasted nor skinned. The recipe does not use any leavening agent such as baking powder or yeast, nor does it include any fat such as butter or oil. The barely wet dough is then baked twice. The second baking defines how hard the biscotti will be. Bakeries today have taken the same recipe from its unassuming origin and turned it into a variety of artisanal delights. All sorts of nuts, fruits, extracts, and liqueurs are being used to create new flavor combinations. There is a flavor for every palate. Low in fats, sugars, and calories, (in most recipes) biscotti are being pegged as the cookie for the current century. Before we get into these almond biscotti recipes, let's talk about the different forms that almonds can be found in and the level of quality that will make your biscotti come to life. Skip to the Almond Biscotti Recipe Collection. So...at the risk of driving you nuts, let's begin. Almonds are not a true nut but the nutmeat found inside the pit of the dry fruit of the almond tree. This ivory colored nut is pointed and oval shaped, with a smooth texture. The almond is a species of tree native to the Middle East and Southern Asia, but is now commonly grown in many areas including the U.S.
Almonds come in sweet and bitter forms. For these recipes we will be using the sweet variety. Almonds have a delicate sweet taste and they are sold whole, sliced, slivered, or ground with skins on or off (blanched), and their flavor intensifies when toasted. To intensify the almond flavor in almond biscotti recipes, almond extract is often added. Pure almond extract (always buy 'pure' not 'artificial') is made by combining bittersweet almond oil with ethyl alcohol. It has a very intense almond flavor which is why it is only necessary to add a small amount to achieve a really nice almond flavor. Almond extract blends well with many other flavors including vanilla, chocolate, caramel, apple, pear, coconut, cherry and strawberry and is a versatile flavor used in frostings, icing, fillings, ice cream and beverages. You can use artificial almond flavoring, but don’t expect to get the same intense real almond flavor of a quality almond extract. Not all almond extracts are the same. Silver Cloud's Pure Almond Extract is stronger than many of its competitors. The added strength results in an extract, which is bake and freeze-proof. This means the flavor does not disappear when you bake and freeze your cakes, cookies and other products. Almond Oil is a popular nut oil enjoyed by gourmets because of its smooth, buttery flavor and roasted almond character. Among the lightest of all nut oils, Almond Oil is excellent for both cooking and drizzling. Cold Pressed Almond Oil, or any cold-pressed oil for that matter, is much more of an artisan product. Since the oil is not heated during the pressing, it retains all of its natural flavor and nutritional benefits. Almond Oil is widely used in baking to add nutty, toasty flavors to cakes, cookies, muffins or cinnamon buns. Just replace a 1/4 cup or even 1/2 cup of the vegetable oil or butter normally called for with Almond Oil. Almond flour is often used as a gluten-free alternative to wheat flour in cooking and baking and is used in some of our Almond Biscotti Recipes. It is full of protein and dietary fiber, and as a flour works well in a wide variety of recipes. Blanched Almond Flour can be substituted for flour in cakes, breads, cookies, muffins, and your favorite recipes that call for flour. Use it as a thickener in soups and puddings too! The taste and texture is phenomenal. With a fraction of the carbs of wheat flour, almond flour provides a hearty flavor and consistency without adding all of those empty calories. Almond paste is made from ground almonds or almond meal and sugar, typically 50-55%, with a small amount of cooking oil, beaten eggs, heavy cream or corn syrup added to bind the two ingredients. It is similar to marzipan, but marzipan contains more sugar than almond paste and often contains additional ingredients such as food preserves and food coloring. Almond paste is used as a filling in pastries, but it can also be found in chocolates and as a higher quality alternative to marzipan. If you want to make your own almond paste, click here. 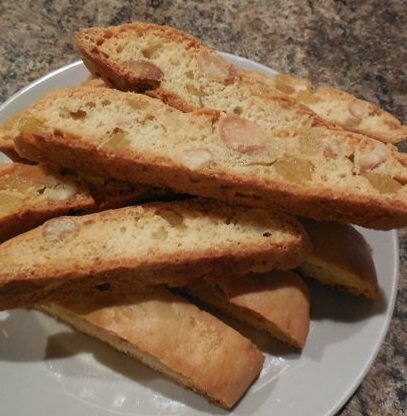 If you want to make the best biscotti, follow our almond biscotti recipes and use the best almond extracts, flours and pastes that you can afford!